Keep used motor oil out of the environment! Johannesburg – There are many causes contributing to the growing water crisis in South Africa. Climate change and rising temperatures are making droughts more frequent and severe, with potentially devastating consequences for agriculture, water supply and human health. This phenomenon is already being observed in the Western Cape, with Cape Town currently facing the real threat of running out of water completely – Day Zero as it has become known. Water contamination threatens already dwindling water resources. Infrastructure is old and/or lacking, and a backlog in services has exacerbated the issue, with valuable water sources being contaminated with sewage and other pollution. Used oil contains harmful compounds and carcinogens that can easily contaminate the environment, especially if thrown down drains, into landfills or onto the ground where it leaches into the water table. The Rose Foundation (Recycling Oil Saves the Environment) has been championing the responsible collection and removal of used oil for proper recycling since 1994. 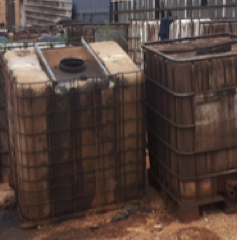 CEO Bubele Nyiba explained that due to a lack of education many people who generate used oil may dispose of it improperly and illegally – pouring it down a drain, throwing it out onto the ground or even re-using it as a dust suppressant, burner fuel, or wood preservative. Build a bund wall around bulk used oil storage tanks so that in the event of a spill or leak, the used oil will be contained. Nyiba says that the safe disposal of hazardous waste has become a critical issue in South Africa in order to protect our environment. * For more information and to find out about an accredited collector or drop-off point, contact the Rose Foundation on (021) 448-7492 or visit the website at www.rosefoundation.org.za.